Applications are open to a fund supporting innovative projects that increase the skills for and knowledge of workers. 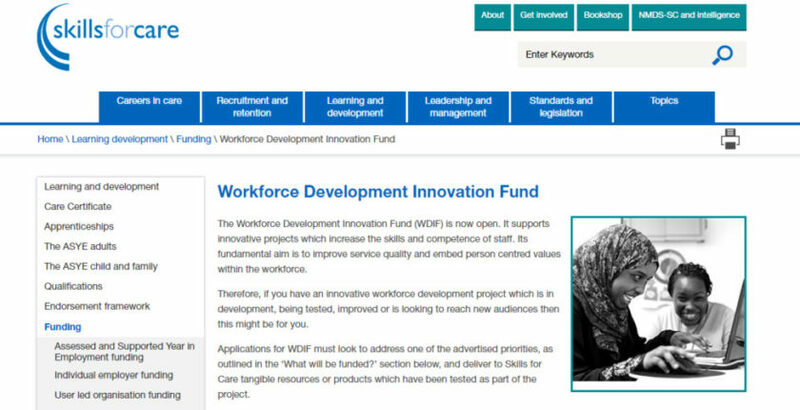 The Workforce Development Innovation Fund (WDIF) supports adult social care workforce developments that are in development, being tested or improved. Skills for CEO Sharon Allen said: “Adult social care is an ever evolving sector so this fund exists to support organisations to be innovative and think differently about the way they deliver services. Funding applications must meet one of the advertised priorities in the ‘What will be funded?’ section on Skills for Care’s website, and be able to deliver tangible resources or products, which have been rigorously tested as part of the project. To find out more and apply please visit www.skillsforcare.org.uk/wdif. The deadline for applications is 1pm on Friday 22 June 2018.